The Fine Arts department is located in East Campus Hall (ECH), a retrofitted former warehouse perfect for studio production. The department encompasses about 30,000 square feet of studios, lecture halls, workshops, galleries, and offices. Fine Arts houses an impressive array of resources, equipment and tools for students working with digital, analogue and fabrication-based processes. Recent acquisition highlights include a SawStop table saw, an Epilog laser cutter and a professional video kit that includes Canon’s C100 Mark II and a handheld gimbal steady-cam. The Visual Resources Centre is located in ECH 1216 and is open daily, Monday to Friday, from 9:00 am until 4:30 pm. It houses our reading room, slide and film collections, and a digital image database. Jean Stevenson, our full-time visual resources curator, oversees this area offering students and faculty individual help with their research. 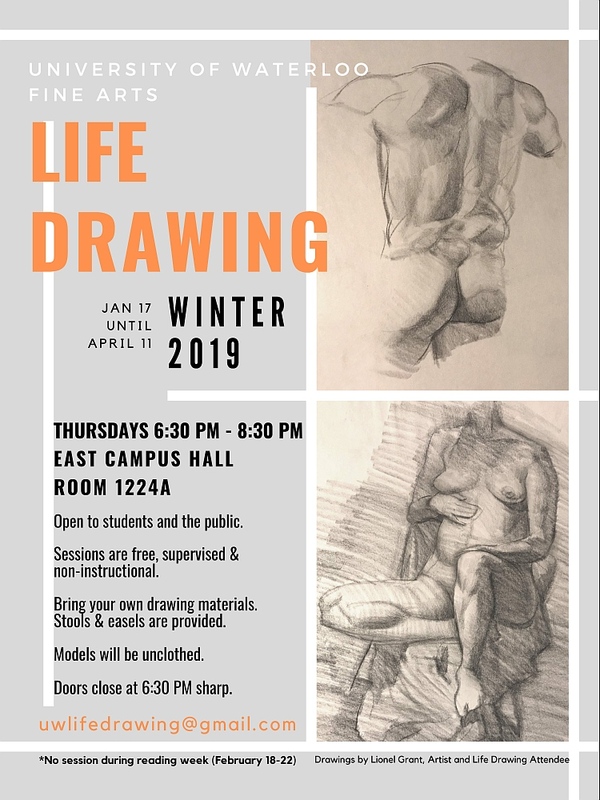 The department regularly offers non-instructional drawing sessions with unclothed models. Check the department event listings or view the Winter 2019 poster for more information. Brush with Art is a program operated by the Fine Arts Department that hangs student art in public yet secure venues on the University of Waterloo campus. More information about the program, submitting work and photographs of some of the venues can be found on the Brush with Art webpage.